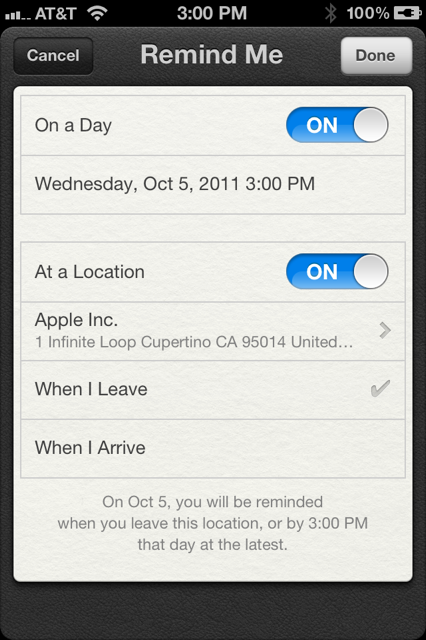 As one of the new iOS 5 apps that Apple introduced at WWDC, Reminders has gotten some attention for its fancy geo-fencing technique that allows you to set reminders based on physical locations. This means that you can set up a reminder to alert you when you are leaving a location or arriving at a location. If you want to remember to bring that extra jacket back home from work, you can set up a notification that will trigger when you arrive there. Don’t want to forget bananas? Set one to trigger at the grocery store. Reminders also got another brief moment yesterday as Scott Forstall, Apple’s VP of iOS Software, showed off the fact that the Siri assistant feature of the iPhone 4S could create a reminder for you using your voice input. The demo included an example of using a location to set up a geo-fenced reminder. But with the rollout of the iOS 5 GM edition, we’ve started getting reports that the geo-fencing features of Reminders will not be a part of the iPhone 3GS version of the app. 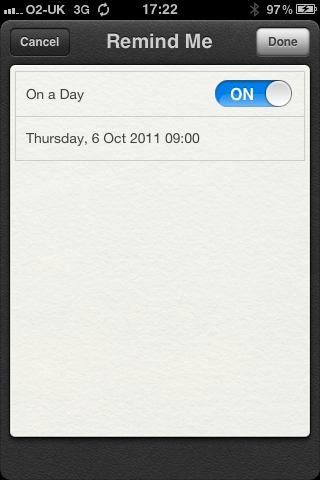 You can see from the screenshots below that the feature does not appear in the reminder creation portion of the app on the iPhone 3GS, but does on the iPhone 4. We’re not sure why on earth this wouldn’t be available to the iPhone 3GS as its GPS capabilities are essentially the same as those in the iPhone 4. We’ve reached out to Apple to see if they can confirm that it will not be a part of the Reminders app on the older device.